Not only is there a once-daily pill that can control HIV infection with just 2 drugs and fewer side effects than the customary 3- or 4-drug regimens, but there may also be a choice between those pills soon. In addition to the recently reported 100-week success with dolutegravir/rilpivirine (Juluca) as a 2-drug regimen for HIV suppression, new data show that dolutegravir (Tivicay) in combination with lamivudine (Epivir), could be an option for both treatment-naїve patients, and to switch to fewer drugs for those with viral suppression (VS). Results from the phase 3 GEMINI-1 and -2 studies presented July 24 at the 22nd International AIDS Conference in Amsterdam demonstrate the non-inferiority of dolutegravir/lamivudine at 48 weeks to a 3-drug regimen of dolutegravir and 2 nucleoside reverse transcriptase inhibitors (NRTIs) in treatment-naїve persons with baseline viral loads of up to 500,000 copies per ml (c/ml). The GEMINI study principal investigator, Pedro Cahn, MD, PhD, Chief of the Infectious Diseases Unit, Juan A. Fernandez Hospital, and Professor of Infectious Diseases, Buenos Aires University Medical School, Buenos Aires, Argentina, related the importance of the findings. "For the last 15 to 20 years, the standard of care for HIV has revolved around 3-drug regimens. Now that we have more potent drugs, the focus is shifting to tolerability and convenience," Cahn stated. "The (GEMINI) studies have the potential to expand the treatment paradigm for first-line therapy of people living with HIV." While the GEMINI studies progressed, another group examined the feasibility of switching to dolutegravir/lamivudine in a retrospective assessment of 48- and 96-week treatment at 5 centers involving 206 virally suppressed adult patients. 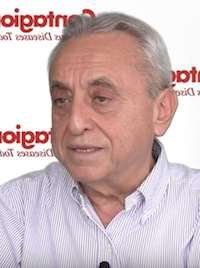 Alberto Borghetti, MD, Institute of Clinical Infectious Diseases, Catholic University of the Sacred Heart, Rome, Italy, and colleagues characterize their study of this treatment switch as the largest to date, and with the longest period of follow-up. The researchers reported an estimated probability of maintaining VS with the switch to dolutegravir/lamivudine of 98.2% at 48 weeks and 95.1% at 96 weeks, respectively. As there were no exclusion criteria for the cohort other than a viral load > 50c/ml, they consider that their findings have particular clinical relevance. "The choice of not excluding patients with comorbidities, previous M184V (mutation) detection, previous VF (virological failure) and coinfections with hepatic viruses allowed a deeper insight into the impact of this dual strategy in clinical practice," Borghetti and colleagues wrote. Although a "not negligible" proportion of treatment discontinuations occurred (27 instances over 217.7 person-years of follow-up), no severe adverse events emerged, and blood lipids and CD4:CD8 ratio were improved at week 48. Borgetti and colleagues indicate that their findings support the safety of this 2-drug strategy, but acknowledge that the lack of a comparator arm and the retrospective design of the study could have led to underestimating tolerability issues other than those leading to the treatment discontinuations. The researchers anticipate that the dolutegravir/lamivudine combination will serve as an alternative to dolutegravir/rilpivirine as a 2-drug switch treatment, and will be particularly useful when dietary restrictions or drug interactions complicate use of rilpivirine. The retrospective assessment, “Efficacy and Tolerability of Lamivudine plus Dolutegravir as a Switch Strategy in a Multicentre Cohort of Patients with Suppressed HIV-1 Replication,” was published in the August issue of HIV Medicine.